Launch day confession: I’m typing this post for the second time… all because I caught myself trying to be far too cute with the “copy/paste” feature. I would say something to the degree of “FML”, but nothing can ruin today. The first real day of the NCAA Tournament is like Christmas Eve… and not the adult version where you have to stay up all night wrapping and building gifts, all without waking that all too curious child who won’t sleep. No, this is Christmas Eve when you’re the kid. Why else do we invent the most asinine excuses for not going to work today or shell out the extra money for a buddy to call in a bomb threat? For the record, I was scheduled off today. I’m a good guy and would never do that, possible prospective employers. 2013: “Surely Ben McLemore is one of the best guards to come out of college in a long time. He won’t fade in the big moment. 2011: “The Morris Twins? Sherron Collins? What’s not to like? I’ve had more failures with Kansas, but if I mention anymore my head might explode. But I feel hopeful about this year because I’ve adapted my strategy to the times. This year, grown-up responsible Justin said, “No” to crazy upsets that make no sense. In fact, save for an experienced Wichita State team looking for a little bit of get-back after last season’s somewhat unexpected exit, every team in my Elite 8 is either a 1 or a 2. Was this by design? Frankly, I’m tired of not even being in play after the first weekend, so maybe a little bit. But I just think that’s how the bracket is going to play out this year. Unlike previous editions, the 2015 version of the tourney is Kate Upton-ey (you’ve seen the commercials and you know what I mean, I’m not even explaining). Not only are there seven or eight teams CLEARLY better than everyone else, we also have a team (Kentucky) who is far and away better than those six or seven other teams. You know the “riskiest” play I made (fine, Wichita St. in the eight is risky, but justified): not picking the Wildcats to win the title. 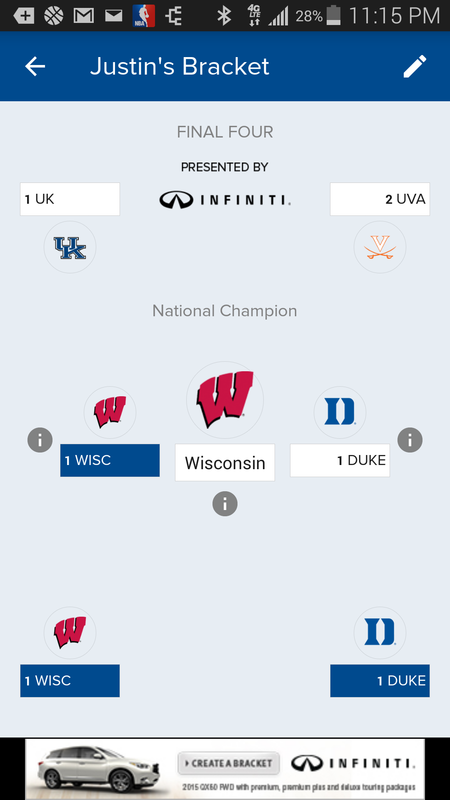 My national champions are the Wisconsin Badgers… and my reasons are legit: 1) They feel they owe Kentucky for last year’s semifinal loss, 2) They play balanced basketball and can win at any pace, and 3) They don’t beat themselves. But there’s a subplot to this tourney for me: I have a pending bet with a friend of mine saying that this will be the year of the perfect bracket (which is sad because it’ll be a year too late). Of course, watch this be the year that Hampton beats Kentucky, and we somehow get a final featuring Texas and Providence.